Thank you all for your sweet comments on my last post. We had troubles gettinng the photo's off the camera's on the laptop.. but it finally worked in a other way. DH is still working on it to do it on my laptop..
Last weekend was the day.. Kira's 4th birthday. That Friday, she had for the first time her kids-party. We first eat pancakes, are there kids who doens't like pancakes??? I don't know them.. hihihi. 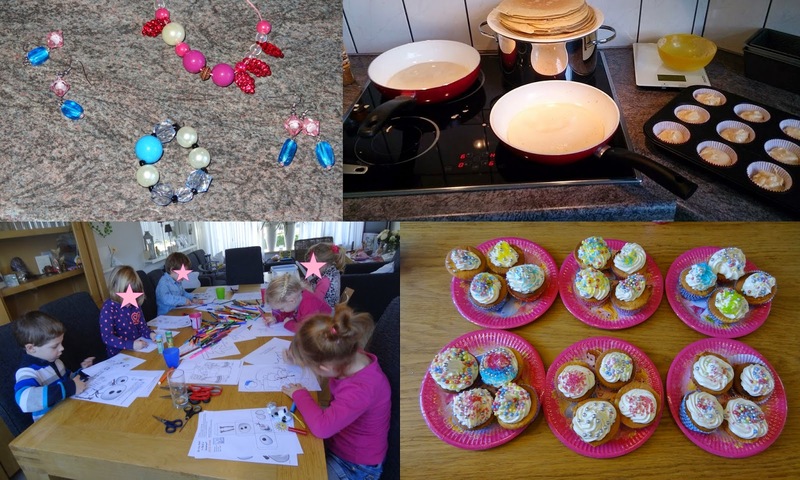 After the Pancakes, we tryed to make jewelry, Dh and I helped al lot. I don't have a picture if them all, but from a few, with two girls I make earrings, Hubby with Noah and a boy bracelets, and Kira and a other girl a necklace. They liked it, but also it was a bit hard still. so will try it again.. neighbor girl wanne come back and do it again. After that ...... sugar time ..... we decorated cupcakes.. I made the cupcakes in the morning with the butter-cream, the kids could put it on that with help rom me, and then decorate it woth color balls and other things.. They had a lot of fun with it. And as last we draw and cut and glue al kind of thing with a Frozen theme!! 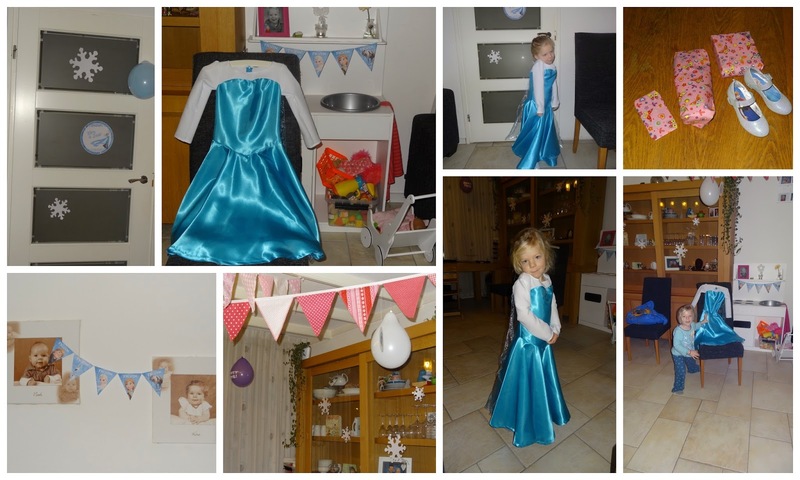 So we made her birthday a little bit in Elsa/Frozen style.. I started to late, so didn't made much, but it was just enough, and she liked it that was the most important thing. Kira run downstairs in too the living to her dress. She came back to me.. mommy mommy thank you thank I love you..
First time she tryed it on.. I was very curious if it would fit, as I didn't use a real pattern and fit it before. I wanted it to be a surprise. I totally forgot to make a picture of her hair. 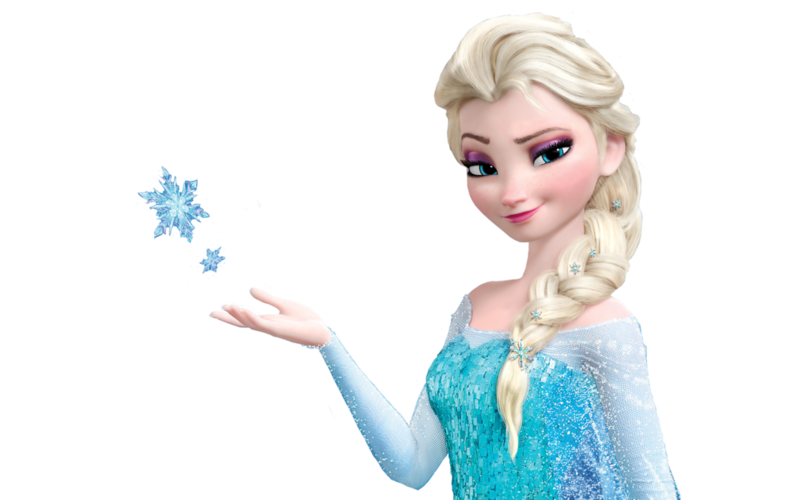 I made the same braid as Elsa did and I had made her 6 hair pins with snowflake on them. 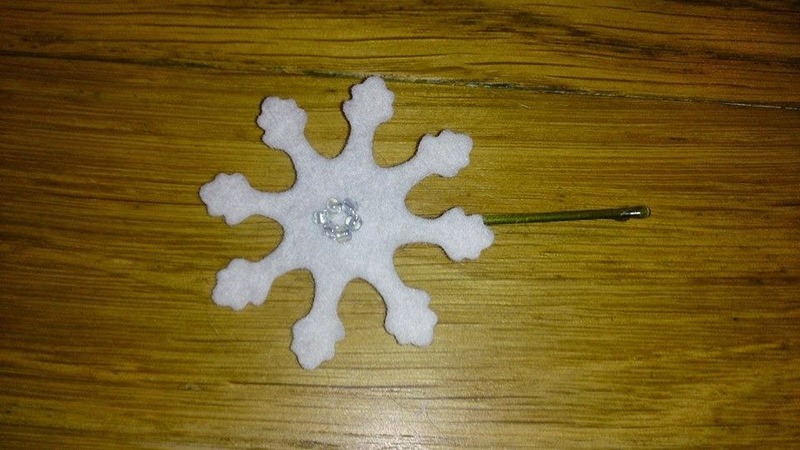 Dear Rita made the snowflakes for me last year with her machine.. I can't cute that beautifull. And so it's easier. and dear Rita loved doing it. On the table you also can see Frozen shoe's. When kira and I where shopping last week, I found them, and could not leave them in the store. so we bought them. A few sizes to big, so she can wear them for a long time. Kira is totally in love with dolls/cuddles.. and handmade are so fun too. 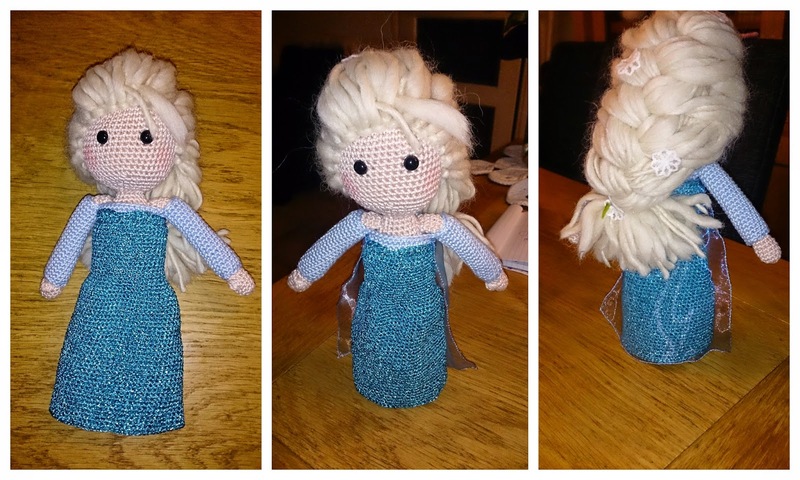 So I made a normall doll, and finished her off as a Elsa Doll. And it worked out as I had in my mind. Then as it was a sunday birthday party we always do a lunch then, because many family have to drive a while and Monday ear;y going to work. So Kira and I made started to make a lunch.. I made stuffed eggs, chorizo-twisters, Ciabatta-bread, mushroom-soup. Above right are sweet cinnamon rolls. they where yummy... omg.. I really have to make them again!!! 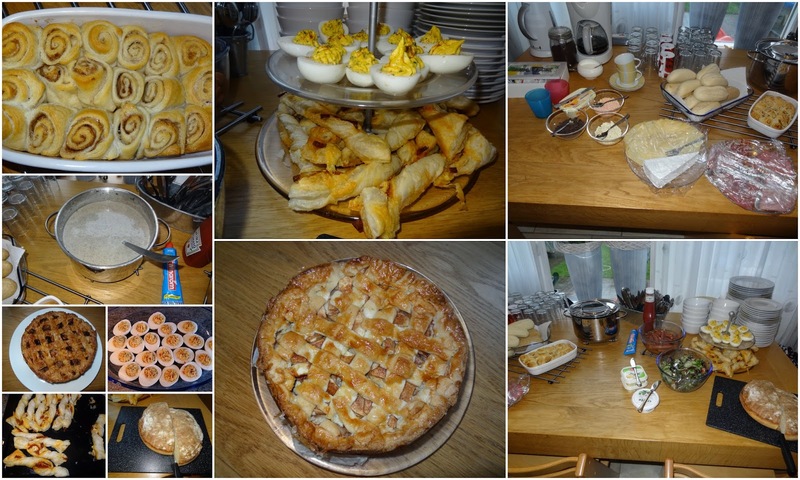 Made a salad, yummy meat/cheese, little baked bread, and some things for on them..
Also two differents Apple pie's.. I like making those, and , most like them too. But every birthday I make a special pie.. This time wanted to make a Frozen one. What I did with Noah's birthday a Starwars picture. I wanted to do again. So ordered one, made a bigger cake then normal, and started decorating..
Kira was in love.. and it was very yummy too.!!! Kira was spoiled so much.. 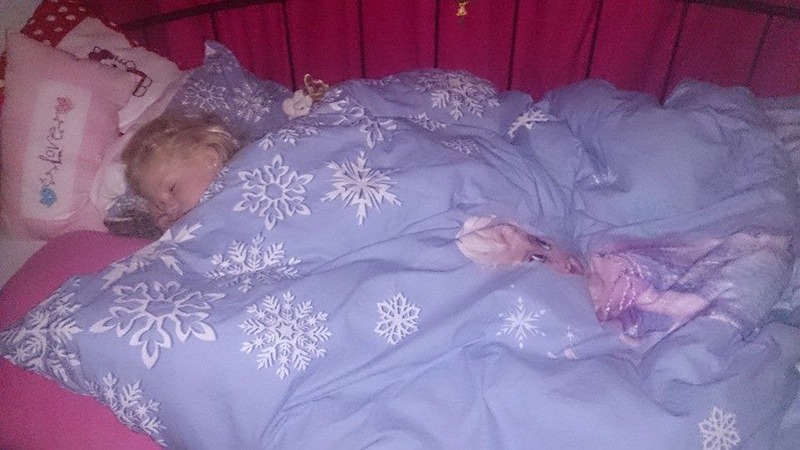 So got a beautifull Frozen duvet. She asked and got some money to but some Frozen things she wants.. They are out if store, so we have to wait a little while. But you can all imagine, she had a magical day!! Happy Birthday , what a fun day my GGD loves frozen too, and sings the song on the phone all the time . Een magische prinsessen verjaardag. Wat wil een meisje van4 nog meer!Helemaal leuk! Birthday wishes to Kira. I bet every little girl in the world would be envious if they saw this post. 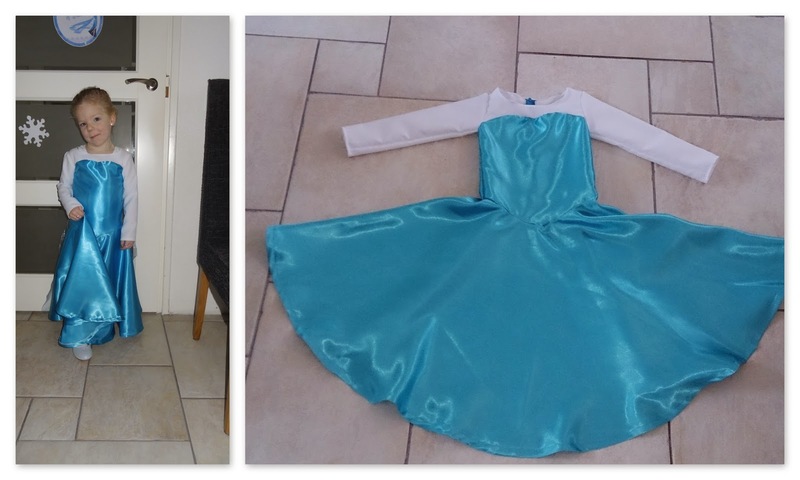 You really outdid yourself with the Elsa theme and you made Kira the happiest person on Earth! She looks absolutely gorgeous in her pretty dress!